The 12-hour statewide bandh called by the Krishak Mukti Sangram Samiti (KMSS), Asom Jatiyatabadi Yuba Chatra Parishad (AJYCP) and 45 other organizations to protest against the Centre’s bid to pass the Citizenship (Amendment) Bill, 2016, in the Winter Session of Parliament, has evoked mixed response in Hojai district on Tuesday. In Hojai town, shops and markets were seen functioning and people were also seen on the streets in spite of the bandh as well as government offices, schools, colleges, banks and L.I.C.I were open. However, Murajhar, Debistan, Nilbagan, Daboka and Jamunamukh areas of Hojai District witnessed total shutdown. Also, transportation service was totally paralyzed in entire district. 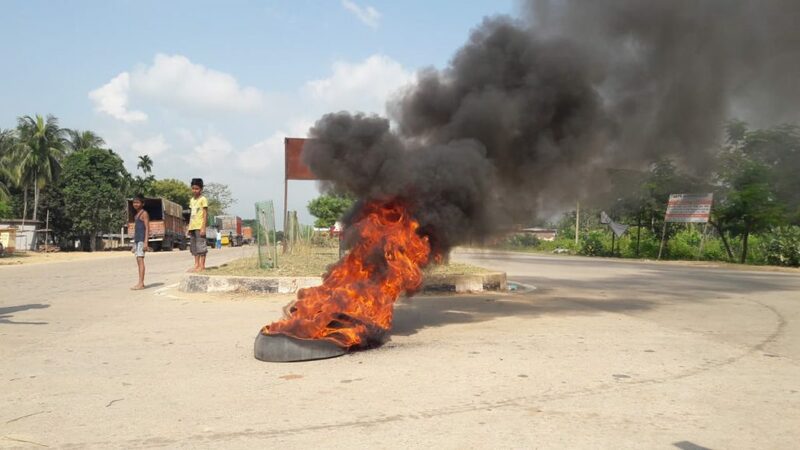 At Nilbagan, in the morning hours demonstrators showcased their support for Assam Bandh by burning tyres at National Highway No. 54 and raised slogans against BJP government. They also took out motorcycle rally in Nilbagan Town in favour of this bandh. Meanwhile, Nilbagan police detained six bandh supporters including five of Krishak Mukti Sangram Samiti(KMSS) and one of Asom Jayatiyawadi Yuba Chatra Parishad. Also, Nokhuti police detained two protesters of Krishak Mukti Sangram Samiti(KMSS). However, Asom Nagrik Mancho has totally boycotted this bandh. Bijoy Chakraborty, General Secretary of Asom Nagrik Mancho has termed this Bandh as unconstitutional and anti-national activity. No major incident happened except burning of tyres by bandh supporters were reported from various places of Hojai district.